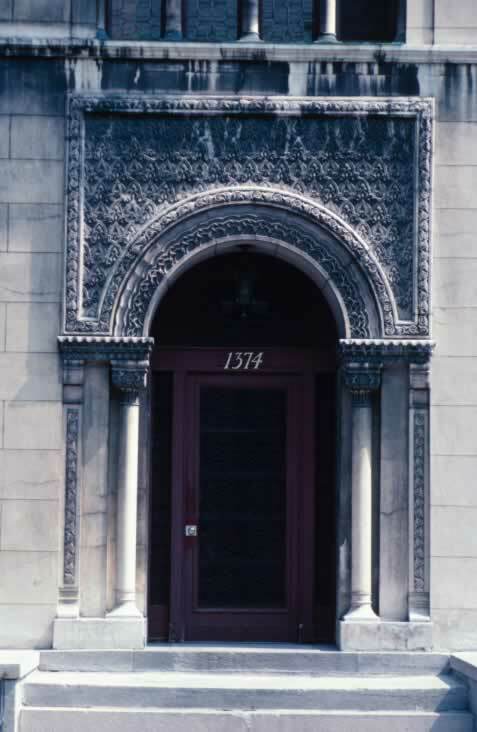 This ten panel exterior door required a subtle elegance so as not to distract from the beautiful carved stone face of the building to which it provides entrance. The carvings are intricate and in several patterns that make the arch even more pronounced. Marble columns flank the doorway, which is nestled directly under the stone arch. The door's frame is finished with a deep burgundy enamel, making it difficult to see the beautiful leaded glass from a distance. Though the arc may draw people to the door, the door's ten panels of leaded red glass only adds to the promise of antiquated mystery. The fixed windows flanking the door, and the bow window above, feature the same red glass. A single stainless knob is the only visible hardware on the door. An antique bronze light fixture is hung from the arch to light the stoop of 1374.